Marvelous Multiagers! : Fun with Leaves! This week, since Columbus Day is quickly approaching, it was only right that we learned about Columbus. However, I am very hesitant to do Columbus Day read-alouds, as I have a really hard time telling the first and second graders that Columbus was a cool guy and was bffs with the Native Americans. Scholastic News came to the rescue with one of this month's issues for first grade! If you have a subscription, you have access to their little preview videos, which are awesome. They're about 3 minutes long and are a great hook to start that week's issue. For some reason, my kids are obsessed with them and we usually watch each one at least 3 or 4 times. Anyway, the video for this issue focused on Columbus being an explorer, and it showed examples of other explorers - underwater explorers, cave explorers, and space explorers. 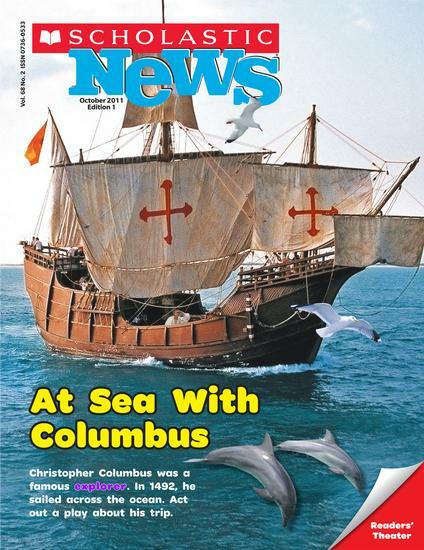 This issue was a reader's theater where I played Columbus and the students were the sailors. We learned that the sailors had to sleep on the deck while Columbus slept in a bed, that they had dirty water, that they were scared, and that their trip took 71 days, which is twice the amount of time we've been in school so far!! All good and factual information. Thanks Scholastic News! The next day, I extended on the "explorers" theme and told the kids we were going to explore the neighborhood! We are lucky enough to back up to a nice quiet neighborhood, and I love to take walks, so this went well. I asked the kids to grab at least 3 different kinds of leaves for an activity later. They ended up each grabbing like 15, which was perfect. It was a BEAUTIFUL day in the Chicago suburbs, so it worked out perfectly! After lunch, we did a variety of activities with our new gigantic leaf collections! We counted them and ordered the numbers. Then we sorted them by a variety of attributes that the students chose. I always hear about doing open sorts with students but I never have done it. It was awesome! Most of my students worked really, really well together without fighting (which is pretty rare in my class...). The attributes they chose were: color, size, number of points, pretty and unpretty (haha), and shape. After everything was done, we debriefed about how we worked together. I told them how SUPER PROUD I was that I didn't see a lot of fighting or crying. We talked about what worked (people took turns, they listened to each other's ideas, no one said mean things) and things we needed to work on (some people were too bossy). I really haven't had them do a lot of group things like this so I was very happy to see that they really could work together. I forgot to say that we also did leaf rubbings! They turned out nicely and I need to hang them up soon! They tell me I don't have enough Halloween decorations in my room................ so hard to please 6-year-olds. What fun activities! Love the leaf sort. That is so funny to read that your class loves the Scholastic News videos. Mine does too! They beg to watch it over and over. Three times is my limit! I am a new follower! :) Thanks for commenting. I love to find new bloggy friends.